Ex-Baby's frontman John Waite launched a solo career in 1982. 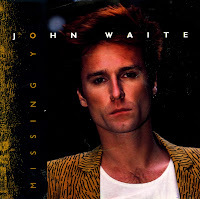 The 1984 hit single 'Missing you', from his second solo album 'No brakes', became a worldwide hit. It topped the US Billboard Hot 100 chart and reached number 9 on the UK singles chart. The music video of the song is one I saw a lot back in 1984. The lyric of the song starts with 'Every time I think of you', which is actually the title of a single by the Baby's.